by Artists by Timothy Priano and has bedecked the digits of Alyssa Milano, Amy Adams, and Drew Barrymore, to name a few. Fricke explains why working in a salon is not really an option for people with representation: “I could be working tomorrow and just don’t know it yet. Even when you do know you have a job, you don’t get call time and location details until the day before. This makes regular salon hours diffi cult to maintain.” Despite the lack of salon presence, most agencies still prefer to represent licensed manicurists. 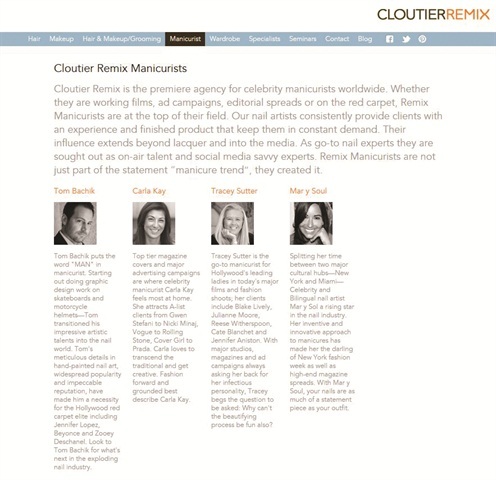 Madeline Leonard, director at Cloutier Remix — the agency to first represent manicurists — says the benefits to having an agent are endless. “An agent has a good reputation and an enormous amount of industry contacts. We have many shoots and projects going on daily. Clients call an agency because there’s a strong trust. They know we will coordinate the right manicurist for them.” Agents hook celebrities and models up with manicurists for all sorts of jobs such as editorial photo shoots, ad campaigns, and red carpet events. Due to the nature of the business, those serious about getting an agent should consider relocating to either New York or Los Angeles. If you aren’t willing to be bicoastal you might be able to find smaller markets and firms in locations like Miami, but the entertainment capitals are your best bet. For example, Cloutier represents five nail artists in Los Angeles and one who resides in New York. Once you’ve decided you want an agent and live in the appropriate location, you will need to build your portfolio. “The most important thing for an aspiring Nailing Hollywood artist is a strong portfolio,” says co-founder Vanessa Gualy. Nailing Hollywood is the industry’s first agency solely dedicated to nail stylists and represents giants such as Jenna Hipp, Madeline Poole, Stephanie Stone, and Karen Gutierrez. “You need to be ready to approach an agent,” echoes Leonard. This means you have a portfolio of published images, any red carpet work, videos, commercials, a website (though it doesn’t have to have all the bells and whistles), a resume, and bio that are all professional-looking. Social media isn’t necessary but can be a plus. “It’s good to be licensed and fully trained. If you haven’t reached a high level yet, don’t include it. Don’t misrepresent your skills,” warns Leonard. Kandalec recommends finding the best photographer, including agencytype models, and hair and makeup artists in your shoot. “The nails don’t necessarily have to be ultra-long or ornate. Take tight shots of nails where they are the main focus, not the clothes,” says Kandalec about producing the perfect images for a portfolio. Or in the case of Fricke, continue assisting until you get noticed. “Fifth call or not, my second job was repeat business and a celebrity cover. I started building my book, and within a few months, I had caught the attention of OPI, who offered me an exclusive contract that ran for seven years. I used to hear people say, ‘If you are busy working, you don’t need an agency,’ but I find with manicuring that those advertising and celebrity editorial jobs only come through an agency,” says Fricke. She recommends being professional, reliable, and always on time for any job a firm gives you if you want to be represented by them.